The Active Asset Allocator investment strategy is designed to deliver a consistent level of positive returns over time with a strong focus on capital preservation. I follow a multi-asset investment approach, actively allocating between global equities, bonds, precious metals, currencies and cash. I always invest with the primary trend of the market and do not follow a benchmark. Instead, I manage the market risk for clients. This strategy has returned +10% per annum net of fees since inception with a lower level of risk than the average multi-asset fund. My active asset allocation approach is best illustrated in the following chart. Gold Trader focuses on capturing the strongest and weakest parts of gold's daily cycle, buying daily cycle lows, selling daily cycle highs and holding for 10-20 trading days, depending on the cycle count. This approach allows me to effectively manage risk. The strategy aims to capture +5%-6% profit per trade while risking 2%-3% each time, has a win rate in excess of 70% and is structured so that profits are TAX FREE for investors. On 2nd March 2018, I lowered the allocation to equities in the Active Asset Allocator from 20% to 0%, moving to a fully defensive position. Stock markets appear to be setting up for a failing rally, a lower high following the surge to new all time highs in January 2018. Just like in July 2007 when the implosion of two Bear Stearns hedge funds signaled the start of the Great Financial Crisis of 2008, today we are seeing similar implosions in volatility ETF's and crypto currencies. The canaries in the coalmine are starting to sing. 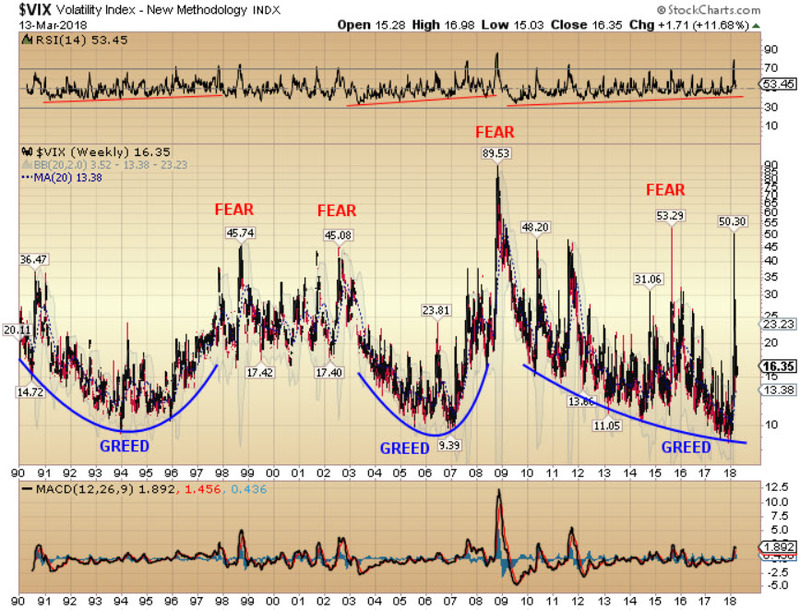 Volatility is on the rise and I expect this trend to continue as we progress through 2018. 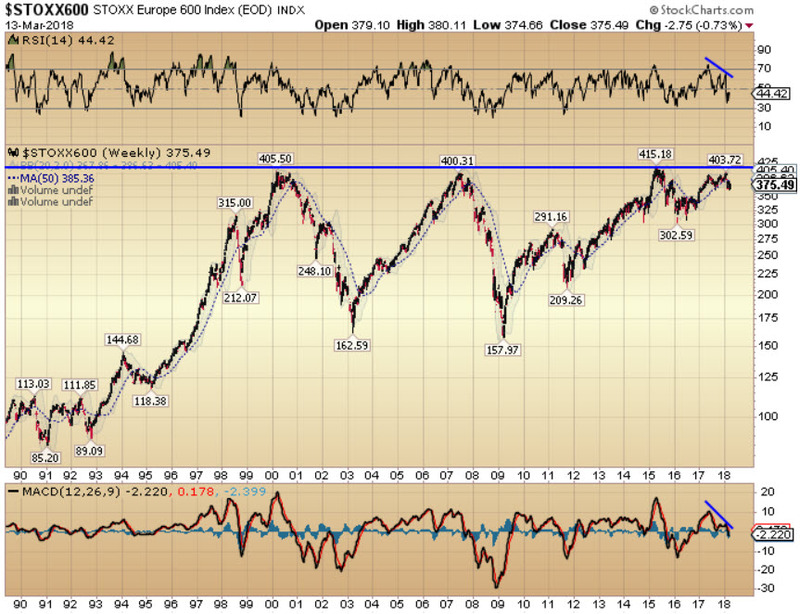 If I am wrong and we are simply undergoing another correction in an ongoing bull market, European equities should break out to new all time highs. If that happens, the Active Asset Allocator will take a position in European shares. So far in 2018, cash has been the better position, outperforming equities, bonds and gold. In January 2018, Jeremy Grantham, Chief Investment Strategist of GMO discussed the potential for a near-term melt-up in the stock market. Two weeks later, billionaire hedge fund manager Ray Dalio was interviewed at the World Economic Forum in Davos, Switzerland and said when asked about markets: "if you're holding cash, you're going to feel pretty stupid". Then the following week, this happened..... and the S&P 500 dropped 12% in 10 trading sessions. Even the best get it wrong sometimes. XIV was one of a collection of exchange traded funds (and notes) that permitted investors to bet on the future direction of volatility in the stock market. In the case of XIV, you made (a lot of) money as long as volatility continued to decline. It worked beautifully over the last two years and leveraged short volatility traders in XIV made out like bandits, until last month. XIV made an all time high on 11th January 2018 at 146.44. It dropped -12% to 129.35 on 1st February and then, three days later, it hit 5.50, down -96%. It turns out, stock markets can be volatile. 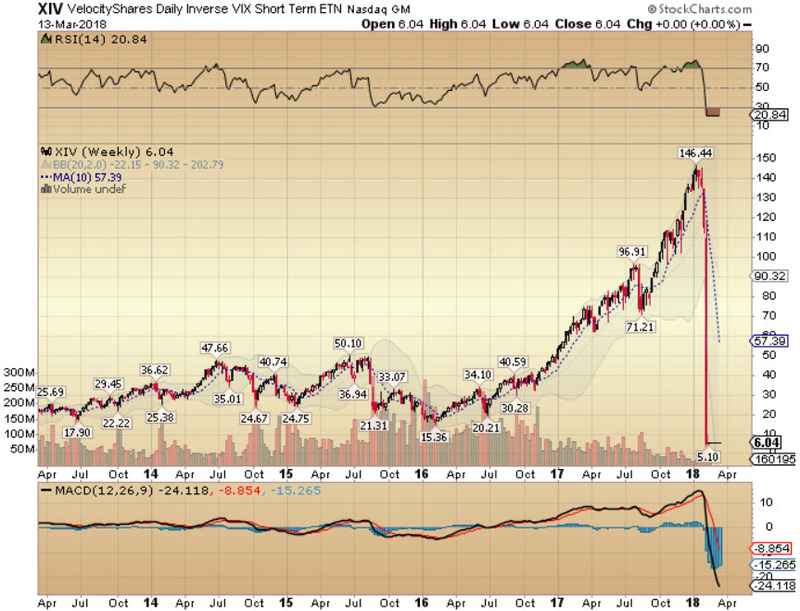 Billions were lost on these short volatility ETF's and this is just the tip of the iceberg. Central bank money printing has distorted markets to an extreme degree. By driving interest rates to zero, central bankers have forced conservative investors to reach for yield in all sorts of exotic and risky financial instruments. Chris Cole of Artemis Capital wrote an excellent in depth report covering the extent of the short volatility trade. Whether it plays out as Cole suspects remains to be seen, but so far he is on track. Volatility as measured by the Vix Index, bottomed at 8.92% on 4th January 2018 and has been moving higher in recent months. Another consequence of too much money chasing too few investment opportunities has been the epic rise and rise of crypto currencies. While blockchain is revolutionary and will likely be disruptive to many markets and industries over the next 5-10 years, the crypto currencies may be getting a little ahead of themselves, until recently at least. There are currently 1,548 different 'crypto coins' listed on the Coin Stats app. Following the initial coin offering (ICO) frenzy of 2017, perhaps a dose of reality is setting in here too. The market capitalisation of these crypto currencies peaked at over $900 billion in December 2017 but has fallen to just $360 billion today. They say equity bull markets don't die of old age. Instead, they require an event or a catalyst to prick the bubble. In July 2007, two Bear Stearns hedge funds imploded, which signaled the start of the Great Financial Crisis of 2008. In 2018, have the recent implosion of short volatility trades and the collapse in price of many crypto currencies signaled the start of the unwind of the 'Everything Bubble'? If so, what comes next will be a sight to behold. We could simply be experiencing just another run of the mill correction in an ongoing bull market, but I am concerned something more sinister is at hand. If you examine the S&P 500 priced in euros, while price continues to rise, relative strength is deteriorating, suggesting the rally is losing steam. I noted in previous updates that I would buy a position in European equities on a break out to new all time highs on the Eurostoxx Index (as long as that breakout held). So far, there has been no break out and EU equities are falling in tandem with the rest of the stock market. So, cash remains the better position for now. For more information on my stock market analysis, please get in touch. You can reach me at brian@secureinvestments.ie or at 086 821 5911. During the last interest rate rising cycle in the US, the Federal Reserve hiked rates +4.25% over 29 months from 1.00% in April 2004 to 5.25% in August 2006. The stock market traded sideways for another 12 months but topped out in 2007 and then collapsed. Stock markets are more expensive today than they were in 2007. From 2004-2006, the Fed kept increasing short-term interest rates until the yield curve eventually inverted. This is shown in the chart below, which measures the difference between 2 and 10 year US Treasury yields. 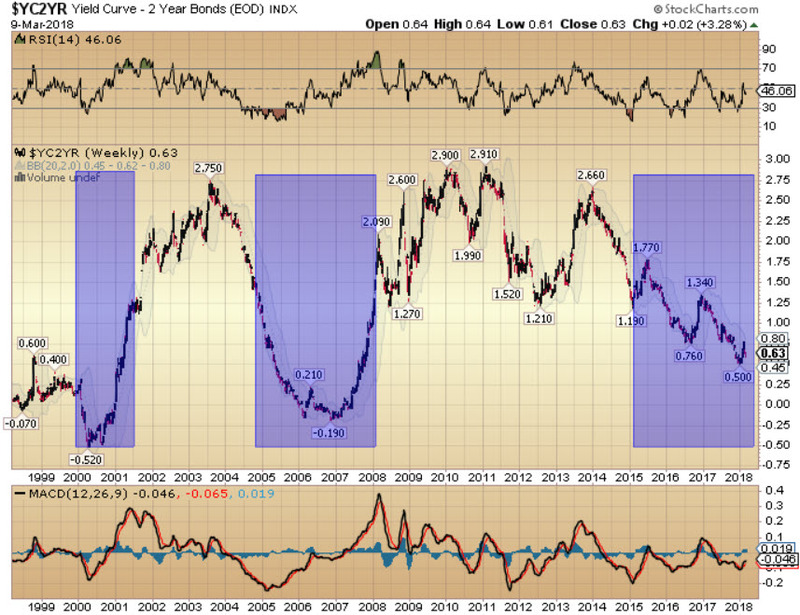 When 2-year yields rise and 10-year yields drop, the yield curve flattens and eventually inverts. An inverted yield curve is often a precursor to recession, and it certainly did not disappoint in 2008. As recession hit and stock markets plunged, the Fed wasted no time dropping short-term rates to zero and firing up the printing presses, which led to a sharp steepening of the yield curve again as the crisis unfolded. This time around, the Federal Reserve has raised rates just +1.50% over 29 months from 0.00% in November 2015 to 1.50% today and the yield curve is 60 basis points from inverting. The Fed has adopted a very cautious approach to interest rate normalisation due to the mountain of US debt currently outstanding: $20 trillion in 2017 versus just $9 trillion in 2008. We may get one or two more +0.25% rate increases in 2018, which could invert the yield curve, but I think we are already approaching the end of this interest rate rising cycle in the US, unless of course inflation starts to accelerate. Then all bets are off. In Europe, unemployment rates are generally higher than in the US and economic growth rates are generally lower, there is more excess capacity in the system and ECB Chair Mario Draghi is still buying hundreds of billions of euros worth of bonds of all varieties. So, there is still a firm bid under the EU government bond market, even before any form of stock market sell off begins. Inflation linked bonds are also behaving reasonably well, though adverse currency movements in GBP and USD have impacted returns to a certain degree. So for now, I remain comfortable with the bond allocation in the Active Asset Allocator. For more information on my bond market analysis, please get in touch. You can reach me at brian@secureinvestments.ie or at 086 821 5911. Gold is starting to get more attention in the financial press. 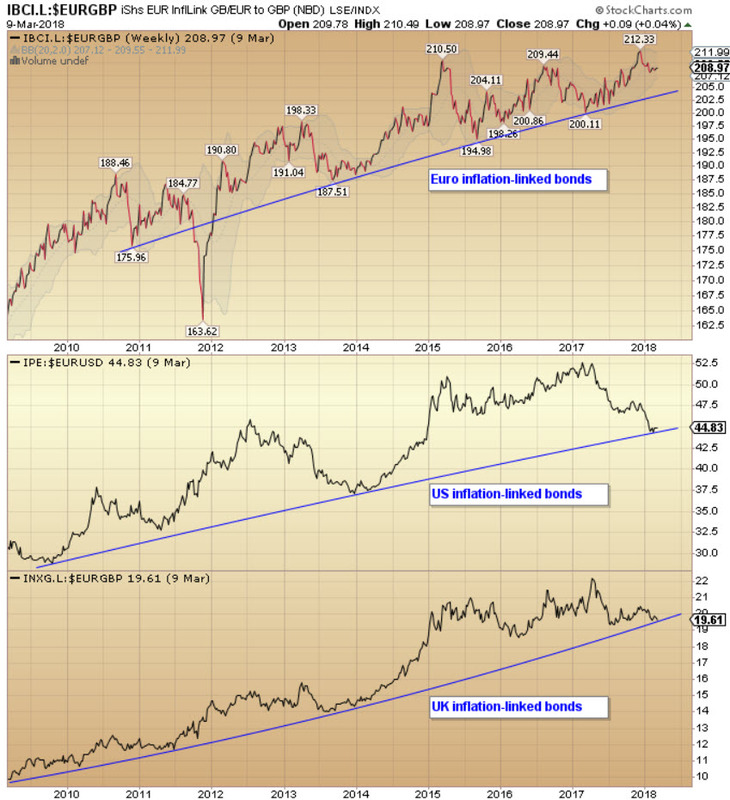 With equities severely overpriced and bond market yields at multi-decade lows, precious metals offer one of the few pockets of value in the market today. Gold has traded sideways for nearly five years now and is starting to form a much more constructive pattern of higher highs and higher lows on the charts, since bottoming in 2015 at $1,045. A break above $1,400 can't come soon enough. If you are following my Gold Trader strategy you will note that gold kicked off a new investor cycle in December 2017 and the first daily cycle delivered a solid +10% rally from trough to peak, ending DC1 +6.2%. Generally second daily cycles also deliver strong returns, +7.7% from trough to peak, on average. This time around however, DC2 was a dud: +3% trough to peak and -2% peak to trough so far. Gold only rallied for 4 days and spent the rest of the cycle chopping sideways, which is not particularly bullish action. We may just have to wait for the next investor cycle before getting a break out above $1,400. It's coming but we just need a little more patience. 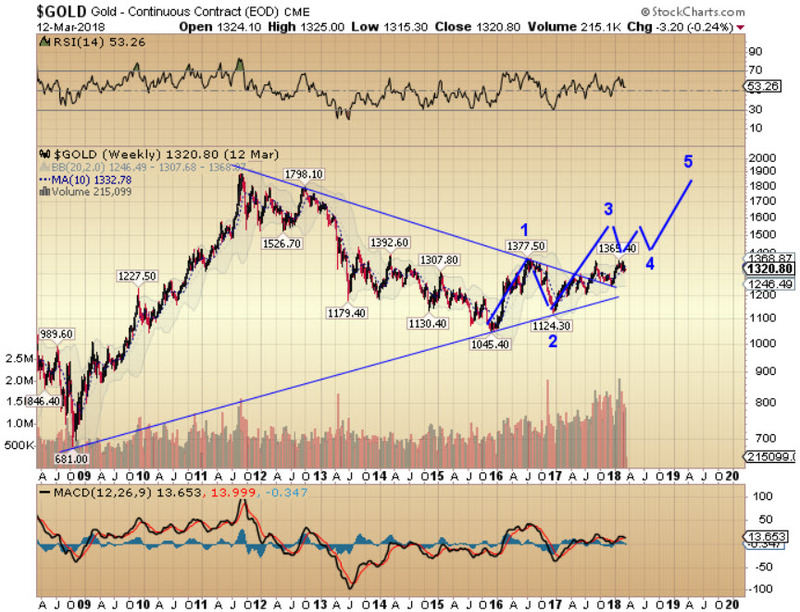 My longer-term projections for gold remain unchanged. For more information on my gold market analysis, please get in touch. You can reach me at brian@secureinvestments.ie or at 086 821 5911.